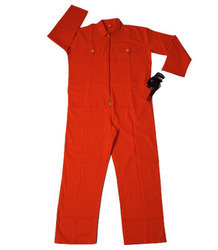 We are offering wide range of Fire Retardant Coveralls such as Cotton Coverall, Protective Coverall etc. These products are manufactured using high grade raw material and are offered at market leading prices. We are involved in offering wide assortment range of Protective Coverall to our most valuable clients throughout the nation. These coveralls are manufactured using very high grade raw material and can also be customized as per client given specifications. Adding more, we offer these products at market leading prices. We are involved in offering high quality range of Cotton Coverall to our most valuable clients throughout the globe. Our entire range is manufactured using high grade raw material procured from reliable vendors of the industry, ensuring durability at customer end. Furthermore, we can also customize these products as per client requirement. Adding more, we offer these products at market leading prices. By: Suraj (india) Pvt. Ltd.